Jamie Oliver has a new show, pitched just before winter so his book can come out for Christmas probably! ( Cynical I know..) I fast forwarded through all his chat and making up of stupid words and sounds ( He takes onomatopoeia to a whole new level.) then, right at the end saw a lovely recipie with one of my favourite ingredients in – Aubergine. I decided to try it for tea the very same night and here is the result! He didn’t use any measurements ( They will be in the book 😉 So I have just tried to gauge it the best I could. *Why on earth does he call a big chunk of Aubergine a Clank… GRRR. 15 – 20 minutes to prepare – 45 minutes to cook. 8 Pieces of Chicken with skin and bone. I used thigh but you could use drumsticks too. For a healthier option use skinless thigh. Heat some oil in a large frying pan and gently fry the chicken pieces in small batches skin side down first until the fat starts to become crispy – Don’t put them all in at once as this will lower the temerature of the oil and they won’t crisp up. Put the chicken pieces aside. 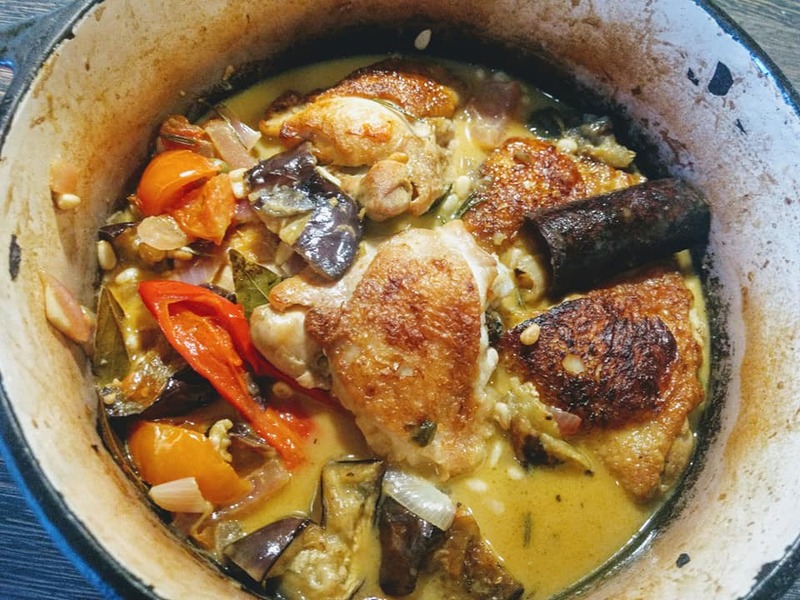 Drain off some of the fat and then fry the aubergine CHUNKS for a few minutes with a few grinds of sea salt until they get some colour and then set aside with the chicken. Wipe the pan clean and add a little fresh oil and throw in the whole red chillis, cinnamon stick and garlic and fry gently so you don’t burn the garlic. Add the sage, rosemary and bay leaves and then the sliced onion. Stir round until the onions get soft then add the capers, chopped tomatoes, pine nuts and lemon juice. I added half a glass of water at this point to make more of a sauce. Season with salt and black pepper. Bring to a boil and then transfer to an oven proof dish/tray and stir in the aubergine and place the chicken pieces on top skin side up to try and keep it crisp. Cook uncovered for 45 minutes at 180 degrees – 160 fan – Gas mark 4. If the sauce appears quite thin after cooking just add a few spoonfulls of cornflour mixed with a little water. ( Make sure you pre mix or the powder will turn your sauce lumpy) and put back in the oven for 5 minutes. Jamie Oliver served his with lemony cous cous but you could serve on its own with bread or even with mashed potato. I’d give it a good stir before serving though to break up the whole chillis!